Ingmar Bergman (pronounced ˈbɛrjman in Swedish, but usually ˈbɝgmən in English) (July 14, 1918 – July 30, 2007) was a Swedish stage and film director. He was one of the key film auteurs of the second half of the twentieth century. His films very often addressed the "death of God" in Western culture, and the subsequent loss of the meaning of life. Bergman's characters often expressed an existentialist despair over the loss of faith, but are trapped in the rationalist universe with no hope of breaking out. Bergman's films were highly personalized, expressing his own struggles with modern life through the struggles of his characters. They were particularly popular on American college campuses in the 1960s and 1970s. Born in Uppsala, Sweden, to a Lutheran minister, Bergman grew up surrounded by religious imagery and discussion. Bergman attended Stockholm University and became interested in theater, and later in cinema. His films usually dealt with existential questions about mortality, loneliness, and faith; they were also usually direct and not overtly stylized. Persona, an avant-garde work and one of Bergman's most famous films, is unusual among Bergman's films. Bergman was one of the acknowledged masters of modern cinema. His films are representative of the artistic, and sometimes non-linear storytelling techniques of European cinema in contrast to Hollywood, stressing the visual nature of the medium over more traditional plotting. During his early period, he worked exclusively in black and white. Some of his most loved files come from this period, including Sawdust and Tinsel (1955), Wild Strawberries and The Seventh Seal (both 1957), the latter two are still recognized as early masterpieces. Through a Glass Darkly, Winter Light, and The Silence are generally considered a trilogy, (although Bergman disputes it) revolving around the existential themes of the meaningless of modern life and “God’s silence.” Bergman’s seeming obsession with the death of God was best received not in his homeland of Sweden, which was already a post-Christian society, but in America, where his films became very popular in art houses and especially on college campuses. In Wild Strawberries, Professor Isak Borg (Victor Sjostrom) travels to his old university to receive an honorary degree on the occasion of the fiftieth anniversary of his graduation. The "wild strawberries" of the title refers to the family patch that Professor Borg associates with the good times of his youth. Much like the "madeleine" in Marcel Proust’s Remembrance of Things Past, the wild strawberries trigger a series of flashbacks in which both Borg and viewer see episodes from his youth during a visit to his family home on the journey to receive his honorary degree. Unlike Bergman’s later set pieces, Wild Strawberries and The Seventh Seal use the picaresque form of the journey. But in Wild Strawberries the journey forward to the university is also a journey backward in time. The film is best known for its early dream sequence in which Professor Borg confronts fears of his own impending mortality. It is a good example of Bergman’s visual narrative, filled with symbols of life and death, including a hearse, a clock with no hands, and a coffin that contains a faceless man. As the dream concludes, the man in the coffin grabs Professor Borg and tries to pull him into the coffin, causing Borg to awake in a great fright. The Seventh Seal was another of Bergman’s early masterpieces. It starred several actors who were part of Bergman’s own “repertory company,” such as Max von Sydow, Bibi Andersson, and Gunnar Björnstrand. Set in the Middle Ages during an outbreak of the plague (historically inaccurate, but symbolically significant), it weaves together the stories of the knight and his squire returning home from the Crusades with the story of a family of itinerant actors and circus performers. It is a religious allegory confronting the questions of faith and God’s existence. On his way home, the knight encounters Death. They enter into a game of chess for the knight’s life, a game that the knight is naturally destined to lose. The game is interrupted by a series of episodes, including the encounter with a troupe of players that include Jof (Bjornstrand), Mia (Andersson), and baby. Jof (Joseph), Mia (Mary), and the baby represent a kind of idyllic, or "holy family." Jof has visions of the Virgin Mary. His spirituality is in sharp contrast with the loss of faith on the part of the knight and his squire. The knight and squire represent two attitudes toward the loss of faith. The knight anguishes over his growing inability to believe, while the squire concerns himself with the cares of this world only. The irony is that it is the squire, not the knight, who is able to actually provide help and comfort to those who need help, like a young girl about to be raped. The knight takes solace with the “holy family” on his journey home. The film confronts religious superstition as the knight and squire encounter a group of flagellates, and later a woman burned as a witch. In the end, Death provides no answers. The knight arrives home and greets his wife, but in the end, Death comes and takes them, along with the squire and several others. The concluding shot is one of the most famous ones in all of cinema. It is an extreme long shot of Death as a kind of pied piper, taking the group hand-in-hand, dancing up the side of the hill. The shot was emblematic of Bergman's style of working. The Scandinavian summer is short, but provided Bergman with interesting lighting conditions. On the afternoon that this scene was shot, conditions were unusually interesting, so he shot the unscripted scene to take advantage of the conditions. Persona is generally recognized as Bergman’s masterpiece. The narrative is framed by an opening and closing sequence of apparently random shots, including a film strip, projector, a light, a spider, cartoons, and other self-referential objects. These images dissolve into and out of the figure of a young boy, who appears to call forth the giant image of a woman. With lots of quick cuts, Bergman moves back and forth between the faces of two women. The imagery of the opening sequence foreshadows the narrative. An actress (Liv Ullmann), who refuses to speak, is attended by a nurse (Bibi Andersson), at a seaside cottage. In a reverse of the patient/therapist relationship, the patient’s silence eventually wears on the nurse. As the tension mounts between the two women, Bergman plays on the similarity of features, juxtaposing the two faces, eventually dissolving them into one another. This use of the extreme close up is a trademark of Bergman’s style. Bergman's films are filled with questions of identity for which the use of the extreme close-up plays a vital role. Bergman’s Cries and Whispers (1973) is the masterwork of his later period. In contrast to the minimalist sets, black-and-white photography, and frequent cutting of Persona, Cries and Whispers is almost lavish by comparison. It makes extensive use of the color red, including filtered fades. The red color is associated with each of the three sisters, around whom the film revolves, especially the dying Agnes. The film explores the complexities of familial relation and emotions, which run the gamut from love to hate. The most famous shot is the recreation of the Pieta with Agnes cradled not by one of her sisters, but the maid, Anna. Bergman’s obsession with religious themes persists, including the apparent resurrection of Agnes, an echo of Ordet (1954) by Danish director, Carl Theodor Dreyer, the most important influence on Bergman. Bergman was known for his collaborative style of directing. Bergman developed a personal "repertory company" of Swedish actors whom he repeatedly cast in his films, including Max von Sydow, Bibi Andersson, Harriet Andersson, Gunnar Björnstrand, Erland Josephson, and the late Ingrid Thulin. 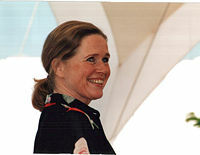 Norwegian actress Liv Ullmann was the last to join this group (in the 1966 film Persona), and ultimately became most closely associated with Bergman, both artistically and personally. Throughout his career, Bergman increasingly let his actors improvise their dialogue. Bergman began working with Sven Nykvist, his cinematographer, in 1953. The two of them developed sufficient rapport to allow Bergman not to worry about the composition of a shot until the day before it was filmed. On the morning of the shoot, he would speak to Nykvist briefly about the mood and composition he wanted, and then left him to work without interruption or comment until they discussed the next day's work. Bergman left Sweden for Munich after he was accused of tax evasion. Though he was later cleared of the charges, he remained in Munich and did not film again in Sweden until 1982. In 1982, he directed Fanny and Alexander. Bergman stated that the film would be his last, and that afterwards he would focus on directing theater. He went on to direct a number of television specials and wrote several additional scripts. In 2003, Bergman, at 86 years old, directed a new film, Saraband, that represents a departure from his previous works. His daughter, Eva Bergman (born 1945), is also a director, as is his son Daniel Bergman. He is also the father of writer Linn Ullmann, with actress Liv Ullmann. In 1970, Bergman received the Irving G. Thalberg Memorial Award at the Academy Awards ceremony. Ingmar Bergman died on July 30, 2007. Björkman, Stig, Torsten Manns, and Jonas Sima. Bergman on Bergman: Interviews with Ingmar Bergman. Translated by Paul Britten Austin. New York: Simon & Schuster, 1973. McBride, Joseph, ed. Filmmakers on Filmmaking: The American Film Institute Seminars on Motion Pictures and Television. Boston: Houghton Mifflin, 1983. The Guardian/NFT interview with Liv Ullmann by Shane Danielson, January 23, 2001. Bergman talks of his dreams and demons in rare interview, by Xan Brooks, The Guardian, December 12, 2001. Derek Malcolm on Wild Strawberries, June 10, 1999. Peter Bradshaw on Faithless The Guardian, February 8, 2001. This page was last modified on 3 March 2018, at 17:50.